THE remains of a young child and over a dozen other skeletons have been unearthed at an ancient burial ground in Northern Ireland - just a few steps away from the grave of St Patrick. The medieval remains were discovered next to Down Cathedral in Downpatrick, Co. Down last year but have only just been revealed by archaeologists. According to BBC News, excavators first thought they had found the lost cemetery of 13th century Benedictine monks – but quickly realised the most ancient skeleton was that of a five or six-year-old child who died almost 1,000 years ago. The most recent remains found during the dig belonged to a teenage girl who suffered from severe tooth abscesses at the time of her death, and who may have travelled to the on-site monastery in search of medicine or prayer before being buried there sometime between 1317 and 1429. The community excavation was led by archaeologists from Queen's University Belfast with assistance from local volunteers to prepare the ground for the erection of a replica high cross. Visitors from around the world flocked to the site as the exciting dig unfolded. Along with the total 16 skeletons discovered, the excavation also saw ancient pottery and animal bones unearthed as well as blackberry seeds, sloe pips, fish bones and charred wheat grains from bread-making in the buried kitchen of a 13th century Benedictine Abbey. 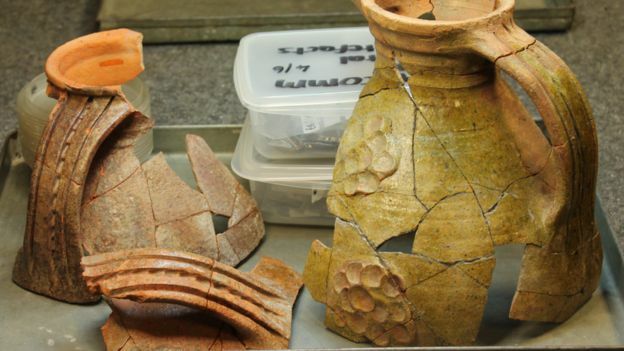 Excavation director Brian Sloan said radiocarbon dating and other analyses of the finds painted a "rich picture of medieval life" at the abbey and a glimpse into an 8th century Christian monastic site. He told the BBC: "We can use this evidence to build up a picture of the diet and everyday activities of the monks who lived and prayed here. Although analysis of the skeletons is ongoing, Mr Sloan said the youngest child whose remains were discovered had died before the Anglo-Norman invasion of Ireland in 1177 AD. 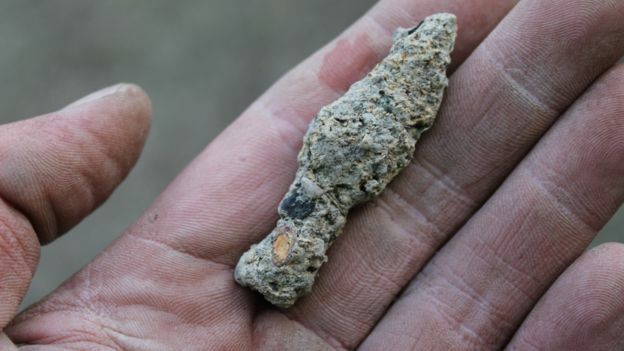 Metalwork recovered from an ancient pit has also been analysed – including fine copper alloy dress pins, a socketed arrowhead, a horseshoe, a pair of iron shears and a length of chain with a suspension hook still attached. A number of the finds are now on display in the High Cross Gallery at Down County Museum in Downpatrick, in two new cases funded by the British Museum Trust. The Downpatrick dig was conducted just yards away from the reputed burial place of St Patrick, who is thought to have died in 461AD. The saint is thought to have been born Maewyn Succat (Latin: Magonus Succetus) in 385AD and was a Roman Britain-born Christian missionary who became the patron saint of Ireland by the 8th century along with St Brigid and St Colmcille (Columba). When he was about 16, Patrick was captured by Irish raiders from his home in Scotland and taken as a slave to Ireland – where he lived for six years before escaping to mainland Europe on a ship with Irish hounds. He entered the church there and later returned to Ireland as a missionary in the north and west of the island, but little is known about the places where he worked and no link can be made between Patrick and any surviving church. The Irish monastery system evolved after the time of Patrick and the Irish church did not develop the diocesan model that he and other early missionaries had tried to establish. Uncritical acceptance of the Annals of Ulster would imply that he dies in 461 aged in his 70s, and ministered in what is today Northern Ireland from 433 onwards. Down Cathedral is a Church of Ireland building that stands on the site of a Benedictine Monastery that was founded in 1183.